Black Dove, White Raven proves that a good writer can turn any topic – or combination of topics – into a great story. This novel has two unusual strands: aviation, and the brutal invasion and occupation of Ethiopia by Italy in 1935. Flying and Ethiopia are particular passions of Elizabeth Wein and she has merged them into a thrilling historical adventure. There’s a bit too much at the start of the novel to take in, and the switch of narrator is at first confusing, but once Wein is in her stride, the threads come together and the action careers along at an exciting and satisfying pace. The story begins in the 1920s in USA, with a pair of daredevil women pilots who perform aerial acrobatics in shows. One (Black Dove) is a black woman. The other (White Raven) is white. 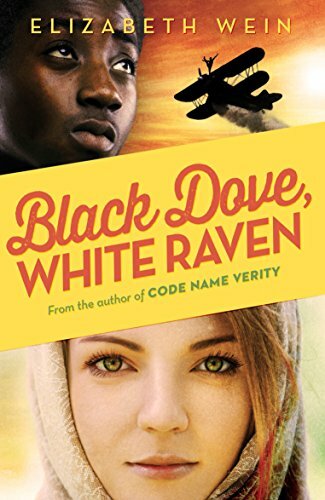 When Black Dove’s plane crashes, White Raven decides to take her daughter Emilia and Black Dove’s son Teowodros, to Ethiopia, the only African country never to have been conquered by Europeans. Together Teo and Em learn to fly, and as the Italians invade the country, they find themselves involved in hair-raising exploits on the ground and in the air. A huge amount of research must have gone into this novel, but it is lightly worn. The breath-taking landscape of Ethiopia and the richness of its history and culture is wonderfully evoked. Not all the research came from books. Elizabeth Wein knows Ethiopia well. She is herself a pilot, and has even stood out on the wings of a flying plane, like the White Raven, herself. Few researchers are prepared to go so far. At the heart of the novel lies the strength of the relationship between two foster-sibling teenagers who are coming to terms with their own identity. Em, the white American sister, has an Italian father. Her brother, the son of an African American mother and an Ethiopian father, is faced with a cruel truth when he returns to his father's homeland. They must both decide whom they will serve in the conflict and how far they will go to ensure the freedom of the country they love – and their own personal freedom too. Elizabeth Laird has travelled round Ethiopia collecting folk stories from traditional storytellers. Her latest novel The Fastest Boy in the World, also set in Ethiopia, is shortlisted for the 2015 CILIP Carnegie Medal.